Where to mount motion activated lights to get the best results. Motion activated lights are a convenient way to keep your home safe when the sun goes down. They turn on automatically whenever a person or an animal passes close enough to the sensor, making it unnecessary for someone to reach for a switch when they need a little light. There are many versions available. Some are free-standing and mount as easily as a smoke detector. The basis of all motion activated lights is that they turn off automatically after motion has not been detected for a pre-determined amount of time, usually anywhere from thirty seconds to twenty minutes. This makes them a handy addition to almost anywhere in need of some illumination. The problem is that many homeowners are not sure where to mount them in order to get the greatest effect. Below are a few things to consider when determining where to mount motion activated lights. Since motion activated lights sense infrared waves from moving objects, it is important to avoid mounting in a high traffic area such as near a street, for instance, where a passing car may regularly turn it on. Blowing leaves or other debris might also trigger the light. The sensor can detect motion at a distance of seventy feet or more and at a range of 240 degrees. Keep this in mind when choosing your location or adjust the settings accordingly. A good place to mount a motion activated light is over the garage, a rarely-used shed at the back of the yard, or by a path that is well-used at night. Cordless motion activated lights are an excellent choice for those places where electricity is not an option. A light located inside a free-standing garage can help the driver park at night, giving him time to get out of the garage safely without tripping over unseen items. Personal safety is also a consideration. Walking from that garage to the house late at night, for example, can be much less safe in the dark, especially if you live in a high crime area. Mounting motion activated lights not only allows the pedestrian to get to the house or apartment safely, but will alert the homeowner of intruders. The housing of the electronic parts of motion activated lights, such as the sensor, the batteries and the light bulb, is protected from the elements, so mounting in locations affected by rain or snow is permissible, such as over the entrance to the garage or outdoor shed. If you have a camper or a cabin, you can mount a motion activated light to the entrance because you can easily turn it off when not in use. This prolongs the batteries and preserves battery life as well as the bulb, though LED bulbs tend to last 20 to 30 years on average. Motion activated lights are one of the most easily used self defense devices available to the average person. They can be mounted in a variety of places to illuminate unsafe or difficult to maneuver areas, and act as a deterrent to intruders, be it people or animals. 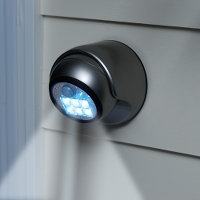 Motion activated lights are a garden product that make outdoor living safe and convenient. And if that pesky raccoon simply does not care if the spotlight is on him, you will at least have an answer to who is getting into your garbage cans late at night, making it easier to keep them away. Where to mount motion activated lights is an essential question when considering the convenience of these illuminating devices. Choose wisely and you will have an easier time when trying to get around your property at night.